One does not see too much in the way of Japanese Army figures for the WWII period. For that matter, Japanese tanks are relatively rare, so it is great that Fine Molds has been filling that empty spot in most modeler's collections. Thanks to the strength of the yen, Fine Molds and other Japanese products are not inexpensive. However, the quality of their products as well as the research that goes into them helps to justify the expense. 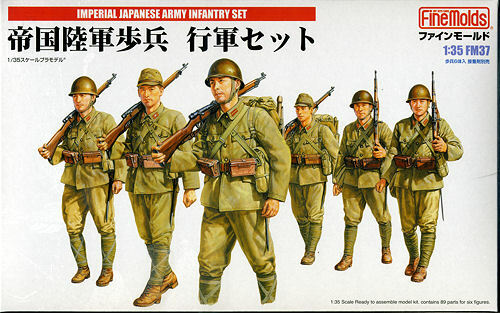 This set is a standard WWII Japanese infantry group. There are six figures all marching. They are equipped with either type 38 or type 99 bolt action rifles and there are a several wearing helmets while some have the soft cap. In line with most figure sets, the painting and construction information is on the back of the box. Aside from the color information, everything is in Japanese. It looks as if the colors are for Gunze paints as the uniforms are to be painted in 'olive drab (2)' with khaki details for the most part. If your interest is in the Japanese Army (and the Japanese had a very large one), then this is a set you should seek out.